People have been asking for a widget version of LookingGlass, so here it is. This is a straight export of LookingGlass Weather Suite (UltraLite Edition). The LookingGlass code automatically detects if it is running as a widget and makes the necessary adjustments, so no modifications are necessary to create a widget version. The most advanced weather object gets even better... I wanted to create something that would take weather objects beyond where they've been before, so I've continued that theme by adding an array of new features, some available nowhere else. Updated 14-Oct-2004. Even if you've downloaded recently, please get this version which contains several new features and fixes. Hourly Forecast: Displays an hour-by-hour detailed forecast for the next 12 hours. Narrative Forecasts: Provides easy to read, plain-English forecasts for each day. Severe Weather Alerts: Provides you with the full text any alerts for your area from the National Weather Service. NEW: Allows Multiple Alerts! --The background image feature is now webcam compatible with an update timer... You can use any internet accessible image or webcam as the background. --Added ability to specifiy location by name... no more looking up codes! --Moon Phase indication! See the photo-realistic moon shadowed as it would appear in the sky each night. --All weather conditions fully animated. Watch for lightning strikes! --Improved accuracy of forecast interpretation with "Layered Weather Effects"
--Customizable background image! Works well for skinning, too. --And much more! See the README file for details. USAGE: Please see the README file in the ZIP for detailed usage instructions. This is the Ultra-Lite Edition (Suite), with the non-animated moonphase. FYI, the version of LookingGlass Ultra-Lite that this was exported from hasn't been uploaded yet, but will be within a couple of days. The currently available UltraLite is an older version. Hitchhiker, please see my reply to your original comment for some clarification. This is really well done and obviously you've put a great deal of time into it. Thank you.. It is really very nice, clean, and useful. Great Job! Thanks very much! I'm glad you like it. You might want to take a look at the versions over in the object library, which offer an animated moon-phase. It's neat to watch. Yeah, I tried messing around with it a bit and I found out my problem. It was just as you said. I didn't select all of the objects (just highlighted with my mouse, rather than going to list objects and selecting. Also, I do realize that this has better preformance as an object, but I was getting this for a friend who does not want this displaying all of the time and just wants to open it every now and then to see the weather. 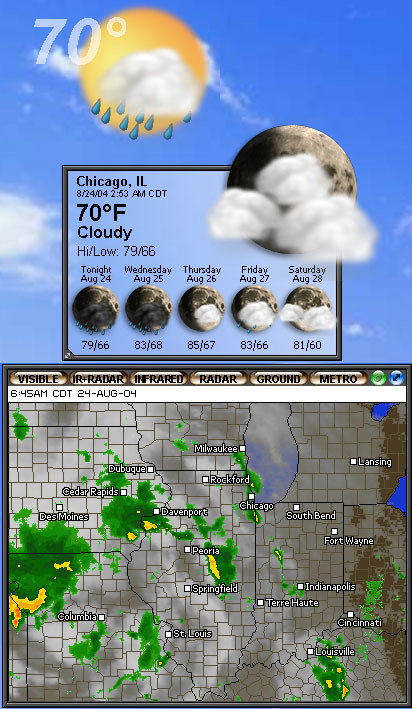 LookingGlass is so well done, and better than many other weather programs out there (eg. weatherbug), so I felt this would be the best choice. Thanks for your help! are you planning on releasing a hight quality widget? It looks awesome in ultra lite. Dave, I'd considered it but decided against it. But let me get your opinion on something. If I release a High Quality widget, it would literally be identical to the object version. I'd just export the object version, and the object version is already available. So what's the benefit? Is the export process something that a large proportion of users are unfamiliar or uncomfortable with? If there's sufficient demand along those lines I suppose I could. However, as I said before, the performance will be better as an object. The HQ version is even bigger, so it will take longer to unzip each time it's run. If used as an object, the files are cached in your theme directory, so there's no startup delay. This widget won't run if you don't have DX installed. It was not built with DX Pro, and only DXPro can export widgets as standalone EXE files. The normal version (which I imagine most of the widgets on this site were built with) builds EXEs that require DX to be installed, although not running. Sorry, I have it installed, I just don't have it running full tilt (Desktop X). The widget works just fine - would just like to see what the better quality looks like Perhaps I'll fire up DX and run the object. Each time you reboot, the widget returns to the center of the screen. It doesn't stay put, I like mine in upper right hand corner of the screen. Is there something I can do to keep it there?? The widget does not control where it is placed on the screen when it is loaded, DesktopX does that. Stardock can tell you where this information is stored on your PC. I don't know why DX would not be remembering where you placed the widget. I loved this Widget. But now suddently even though it is running and in my system tray, I cannot see it anywhere on the screen. I even right click and alternate between show and hide. No effect. Any ideas what I did to make it disappear? Mabey DesktopX moved it off your screen for you... I'd close the widget, then delete the positioning information DX stores for it. When the widget starts, DX (not the widget) decides where to place it on the screen. Delete the stored position information, and it will be placed in a convenient location when it next starts. Contact stardock support to find out where they store this stuff. I've seen this happen to other widgets I've used too... You can also delete the LookingGlass.CFG file in your DesktopX directory, which is where LG's preferences are stored. The display position is not controlled there, however. FYI - All the editions of LookingGlass have been updated to the latest version. to expand or hide the 5 day but the 5 day is transparent. Any Ideas? I am having the same problem as "rgrounds". I don't know whether he got the situation fixed or not but I can't seem to find the positioning that you are talking about. I deleted the .cfg file but that didn't help. Do you have a solution to this?